Testimony of John M. Miano, J.D. WashTech/CWA was formed in 1998 by Microsoft contract employees in Redmond, Washington and quickly affiliated with the 700,000-member strong Communications Workers of America (CWA). By working with the CWA and taking the lead on issues that affect our fellow high- tech workers, our voices are being heard-in the press, in the boardrooms, and in Con- gress. High-tech workers from Silicon Valley to Boston are joining together to work to keep the jobs for which many of us were educated and trained. WashTech/CWA is an innovative and influential union whose members advocate for all technology workers in Washington State and beyond. We are a visionary community of activists and a leading voice for our members in the global economy. We help build economic security and fair working conditions through collective action, bargaining and legislative advocacy. In my oral testimony I focused on the OPT guestworker program. This written testimony has three parts. The first part surveys a number of guestworker programs and identifies some of the problems in each. For many of these guestworker programs, there is very lit- tle information available. The second part puts forth a plan for reforming guestworker programs in general as part of an overall reform of the immigration system. The third part addresses pending legislation—at this point in time, the I-Squared Act. The post completion Optional Practical Training program (“OPT”) is likely to be Ameri- ca’s largest guestworker program. The number of OPT guestworkers has soared in recent years from 28,497 in 2008 to 123,328 in 2013. For comparison there were 128,292 H-1B visas approved in 2013. Given those trends, is it likely there are already more aliens enter- ing the workforce on OPT than H-1B. OPT is unique among guestworker programs in that it is entirely the creation of regu- lation. There is no statutory authorization whatsoever for aliens to work on student visas. On its own initiative, the Immigration and Naturalization Service started allowing aliens to work on student visas in 1947 through regulation. At that time, work on student visas was limited to that which was required or recommended by the school and the work was supervised by a training agency. By 1986, the INS was permitting some aliens to work after graduation on student visas when the school certified a similar work experience was not available in their home countries. In r99r, the INS started allowing all graduates to remain in the United States to work for up to a year after graduation. In 2002, USCIS allowed aliens to work after graduation without having ties to a school. In 2008, USCIS expanded the duration of OPT to up to 35-months for the very purpose of circumventing the statutory limits on H-1B visas. DHS recently announced that it will extend the dura- tion even longer. OPT has no labor protections of any kind. Aliens on OPT do not even have to be paid at all. While DHS requires aliens to work in an area related to their major area of study, DHS has no ability to ensure that this happens. Under OPT, over 125,000 foreign work- ers a year are simply turned loose in America with no supervision or restrictions. Congress has exempted aliens on student visas from Social Security and Medicare tax. Therefore, aliens working on OPT are inherently cheaper to employ than Americans. This arrangement makes OPT ideal for the contract labor (bodyshopping) industry. An employer can hire aliens on OPT then farm them out to other companies. The industry practice is for the employer to take a percentage of the wages paid by the company where the alien actually works. Unlike H-1B, the employer does not have to pay the alien when he is not billing. The fundamental problem with OPT is that these aliens are on student visas but they are not students by any definition of the word. Under the statutory definition of F-1 stu- dent visa status, aliens on student visas must be bona fide students, solely pursuing a full course of study at an approved academic institution. In creating OPT, the INS (and now DHS) have simply ignored the statutory requirements Congress imposed on student vi- sas. DHS does not published data on OPT so there is little information available. I have received data on OPT obtained through FOIA. The clear trend in the data was that the academic institutions supplying the largest number of OPT workers tended to be those with low admission standards. WashTech’s lawsuit alleges that DHS did not follow the procedures required by the Administrative Procedure Act when it promulgated the 2008 regulations expanding OPT. DHS promulgated the regulations without giving notice and comment; resorted to misrepresentation to establish a worker shortage; and improperly used incorporation-by- reference in the regulation. WashTech’s also challenged the OPT program itself as being in excess of DHS’s statutory authority. In November 2014, the District Court for the District of Columbia held that WashTech had standing to bring the action but that it could not pursue the claims ad- dressing whether the OPT program, as it existed prior to 2008, is lawful. The case is scheduled to be over April 6th, 20r5. I. Student visas should be solely for students. Congress’s sound policy of student visas being solely for education is under attack. Indus- try views foreign students as a source of cheap labor and universities see foreign students as a source of full tuition and means to pack graduate programs beyond economic need. An immigration system that uses student visas as a source of foreign labor is inherently unworkable and unenforceable. II. Congress should look at the role the doctrine of legal standing plays in administrative abuse. It is worth pointing out the role the doctrine of standing plays in this abuse. Congress delegates authority to agencies to implement regulations. At the same time Congress has delegated the authority to ensure those regulations conform to its statutes to the Federal Courts. The Supreme Court has created rules of standing that a plaintiff must overcome before challenging regulatory abuse. Unfortunately, standing is more politics than law. See, e.g., Richard J. Pierce, “Is Standing Law or Politics?”, 77 N.C.L. Rev. 1741. The body of case law addressing standing is inconsistent (to be polite). Agencies can ignore their statutory authority and the procedures required by law be- cause they work under the assumption that they can get challenges to unlawful regula- tions dismissed on standing. The pre-completion OPT program and CPT programs also allow aliens to work on stu- dent visas while enrolled at a school. There is very little known about these programs be- cause DHS reports no data. I have seen evidence that there are operating in the U.S. that are merely functioning as conduits for aliens to enter the job market under student visas through CPT. The information I have seen suggests that a comparison of work locations to school locations will show widespread abuse in these programs. I believe one would find large numbers of aliens are working in locations so remote from their school that they could not possibly be attending classes as well. There has been a long history of administrative abuse of the immigration system. Over time, the executive branch starts admitting labor on visas for which such labor is not in- tended. In point of fact, the H-1B visa was created to counter such administrative abuse. DHS has recently adopted a new interpretation of the Immigration Reform and Con- trol Act of 1986. Under this interpretation, DHS claims a provision that bans employers from hiring illegal aliens grants it unlimited authority to authorize aliens to work in the United States. In other words, DHS is now claiming that it—not the Congress—determines the con- ditions for aliens to work in the United States. DHS recently used this interpretation to justify authorizing aliens on H-4 visas to work (with no labor protections whatsoever) when Congress has not granted them that authority. If Congress does not rein in this interpretation, every protection for working Americans in the immigration system can be wiped out. B visitor visas are not supposed to be used for work in the United States. However, this is clearly happening. When I worked for Digital Equipment in the early r99o’s, I saw first hand the company using B visas to import foreign workers. Then the purpose was to as- sist foreign contract workers to dodge income taxes. When a B visa expired, the foreign workers took a vacation to Bermuda or the Bahamas, got a new B visa, and returned to the United States. In the early 2ooo’s, working as a computer consultant I saw, first hand, foreign out- sourcing companies using B visas to circumvent H-1B visas. Certain foreign consultants would suddenly disappear for a few weeks to return home every so often to get a new B visa. The foreign workers would throw a party when a coworker switched to an H-1B visa because that meant they had to be paid more and they became eligible for green cards. We knew the names of the companies supplying the foreign workers but we did not know which company supplied each specific worker. Therefore, it was impossible to know which companies were we using B visas. Infosys, the largest user of H-1B visas, recently settled a lawsuit with the Department of Justice over using B visas to import foreign workers. L (intracompany transfer) visas authorize admission to managers, executives, or employ- ees with specialized knowledge. There is virtually no data available on L visas. There is great concern among labor groups over this program because there are no labor protections and there is suspicion that employers are using the “specialized knowledge” path to circumvent restrictions on other guest worker programs. O visas for highly skilled workers are not generally a concern for labor right now. The high standards required for an O visa make this program the most difficult to abuse. However, this view will change if the standards for O visas are lowered. There has been talk of administrative proposals to do just that and signs that the O visa standards are being ignored in some instances. American workers would not want to see a repeat of what happened with the H-r visa that existed before 1991. The H-r visa was intended to serve the purpose of the current O visa. Because it was only supposed to apply to highly skilled workers, it contained no la- bor protections. However, the INS started classifying anyone with a college degree as be- ing eligible for H-1 visas. This deprived professional occupations any protection from foreign labor. Congress responded to this administrative abuse by creating the H-1B visa and imposing limits on admissions. H-4 visas are for dependents of H-1B visa holders. On February 25, 20r5, DHS, with- out any statutory authority, announced it would allow certain H-4 holders to work. Con- gress should be concerned that DHS now believes it has the authority to determine which visas allow aliens to work. I can say the most about H-1B visas because, as little as it is, there is more information available about this program than any other. I. The H- 1B Program has been a complete failure. Excerpts from the legislative history of the H-1B program demonstrate that it has been an abject failure. 2 Igor I. Kavass, Bernard D. Reams, Jr., The Immigration Act of 1990: A Legislative History of Pub. L. No. ror-649 1997. Giving more foreign labor to industry is like giving cocaine to an addict: they simply want more. The number of industry leaders who come to Congress begging for more foreign labor demonstrates that the H-1B program created dependence on foreign labor. As we can see from Southern California Edison, Walt Disney World, Northeast Utilities...foreign labor has become the first choice. The number of H-1 visas Congress found excessive in 1990 was 78,000. P. 44. The Immigration Act of 1991 set the H-1B cap at 65,000. In FY 2013 the number of new H-1B petitions approved was 128,291. II. H- 1B has a poorly defined purpose. H-1B workers are officially non-immigrants. At the same time, H-1B workers are explic- itly allowed to apply for immigrant status. The various provisions of the H-1B program are confused because the program is not strictly for guestworkers. III. The H- 1B statutes are overly long, convoluted, and misleading. The H-1B program is worthy of 2, maybe 3 pages of statute. The H-1B statutes are so confusing that it takes a lawyer just to figure out the fee for an H-1B visa in any given circumstance. And separate H-1B-look-alike visas for different countries. There should be one set of rules that apply to all H-1B visas. The complexity has been growing unchecked over the years. One of the clearest examples is enforcement. It would take one sentence to say, “The Department of Labor has authority to enforce the provisions of this section.” Instead, the H-1B statutes go on for pages specifying when and when not, the DoL may enforce the law. IV. H- 1B allows foreign workers to be paid extremely low wages. The current law allows H-1B workers to be paid at the 17th percentile of U.S. wages. 8 U.S.C. § rr82(n) requires H-1B workers to be paid at least the prevailing wage. How- ever, 8 U.S.C. § rr82(p) requires the Department of Labor to provide four skill based prevailing wages. There is no requirement that H-1B worker be paid at his actual skill level (If there were such a requirement, it would be unenforceable—how does one objec- tively measure skill?). Skill Level Wage Percentile % of LCAs Programmer Wage in D.C.
Notice that if that law required H-1B workers to be paid at least the actual prevailing wage, the H-1B quota would not come close to being used up. Also notice employers call H-1B workers “highly skilled” when they want more of them but employer say those same workers are low skilled when it comes to determining what they have to be paid. V. The H- 1B statutes explicitly allow employers to replace Americans with foreign workers. The replacement takes place within 90 days of filing the H-1B visa petition. When the H-1B quota is used up more than 90 days before the start of the fiscal year, these restrictions never apply. In many areas of the country, the average wage for a technology worker is much higher than $60,000. There are many “quickie” master’s degree programs. Therefore, all four of these conditions are unlikely to occur together. The ability to replace Americans is deliberately hidden through two layers of indirection within the H-1B statutes. 8 U.S.C. § rr82(n)(r) bans replacing Americans except in the case of an application described in 8 U.S.C. § II82(n)(I)(E), which allows such re- placements to take place when the foreign workers meets the requirements of 8 U.S.C. § rr82(n)(3). Combining the provisions of those three subsections gives the restrictions listed above. VI. The H- 1B program allows employers to bind the foreign workers to their employer. In the United States, Employers have the benefit of employment-at-will where they can terminate employers for any reason or no reason at all (with a few public policy excep- tions). In addition to that advantage, the H-1B program explicitly authorizes employers to assess “liquidated damages” against H-1B workers the quit. An H-1B worker who tries to change jobs can find himself in the position of having to pay tens of thousands of dollars to his former employer. Ironically, this change was added to H.R. 3736, ro5th Congress, at the same time the provisions explicitly allowing employers to replace Americans with H-1B workers were added. 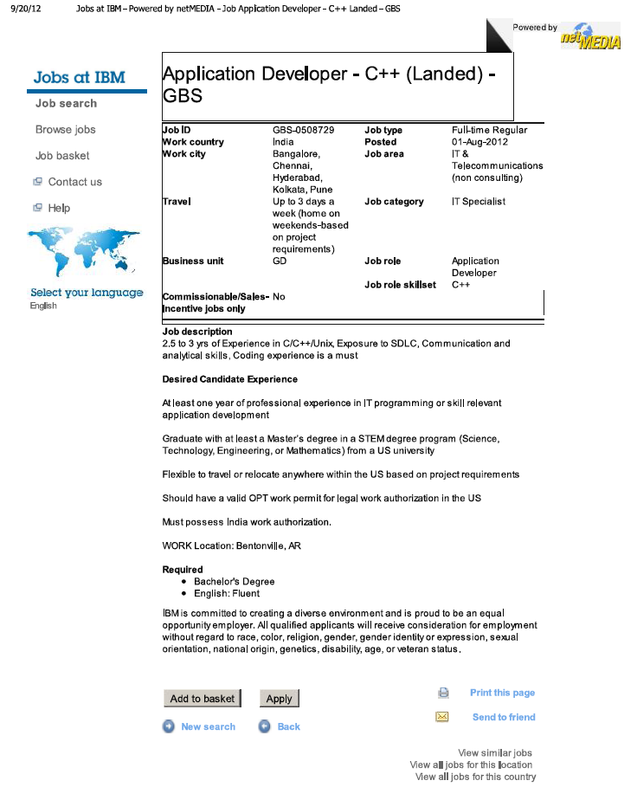 Here is an advertisement posted on IBM’s corporate web site for a programming job in Bentonville, Arkansas. Applicants must be on OPT and be Indians. Notice that the indexed work location was listed as “Bangalore, Chennai, Hyderabad, Kolkata, Pune” so IBM was fined $44,000 for placing these and similar advertisements. Such penalties are far to small to prevent this kind of abuse. In comparison, IBM’s CEO earned $19,345,125 in 2014. The fine for flagrant discrimination against American workers is about a half-day’s pay for IBM’s CEO. Companies cannot find workers because of poor recruitment. I. Computer jobs are over specified. 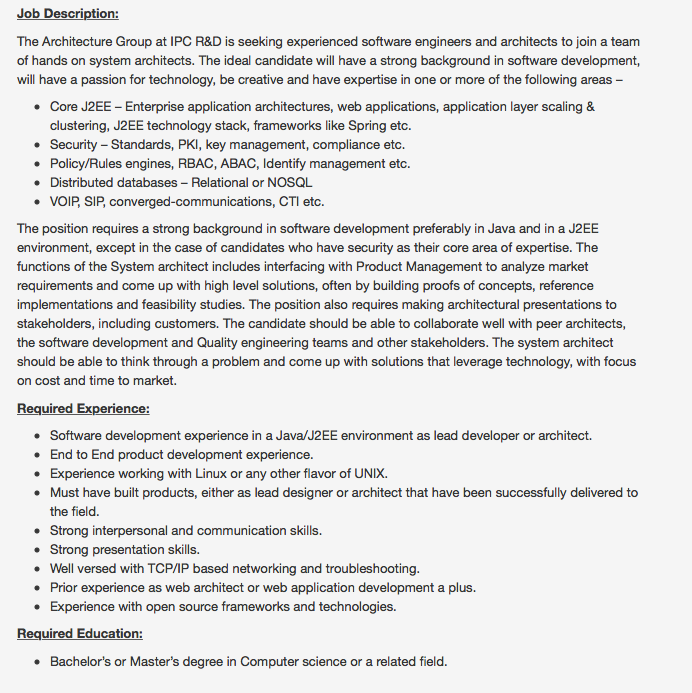 Note the specificity of the programmer job requirements to the generality of the lawyer job requirements. Keep in mind the candidate has to get past both the recruiting compa- ny and the actual hiring company (if it even exists). 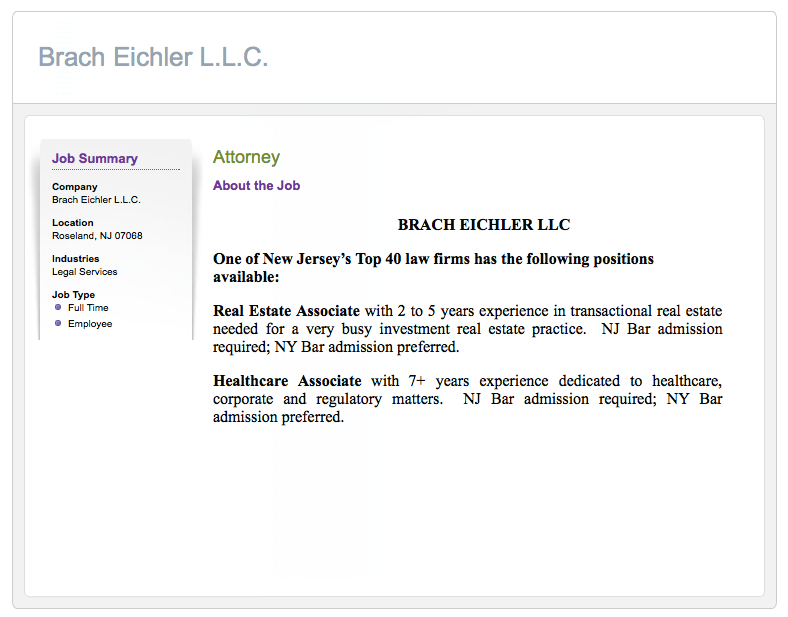 The lawyer candidate applies directly to the hiring firm. The firms that supply H-1B workers get around this problem by making fraudulent resumes. II. Few job postings are for actual jobs. 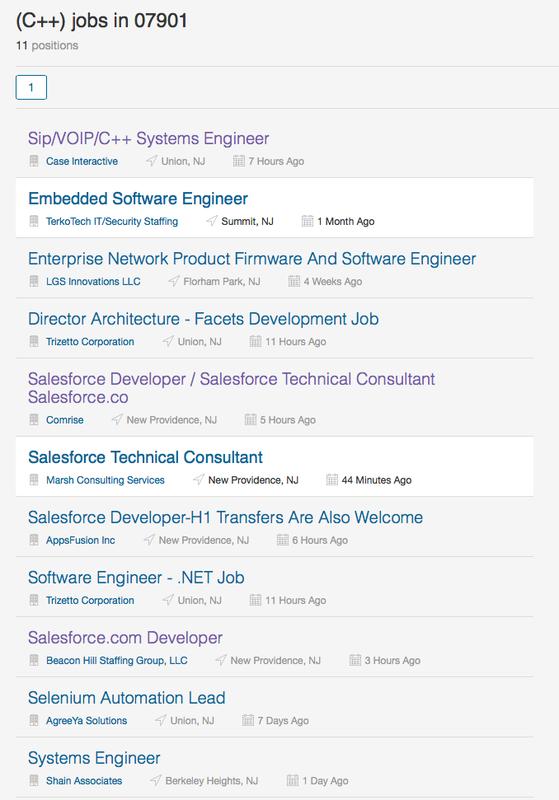 These are the C++ jobs listed within 10 miles of my home on DICE. Not a single posting is for an actual job. These are all postings made by agencies. A job seeker has no way to tell of the poster is just collecting resumes or whether there is a job. —clearly are all for the same job posted through different agencies. American technology workers are frustrated because they hear repeated claims that there are huge numbers of jobs available but, when they go to job boards, there are few, if any real jobs posted. All net job growth is going to people not born in the United States. Financial Incentives are twisted. The CEO of Northeast Utilities (Now Eversource) replaced 200 Americans with H-1B workers and received a $1,300,000 pay raise. Boston Globe, March 13, 2015. Roughly one-third of the on-paper savings from 200 job losses are going straight into the CEO’s pocket. 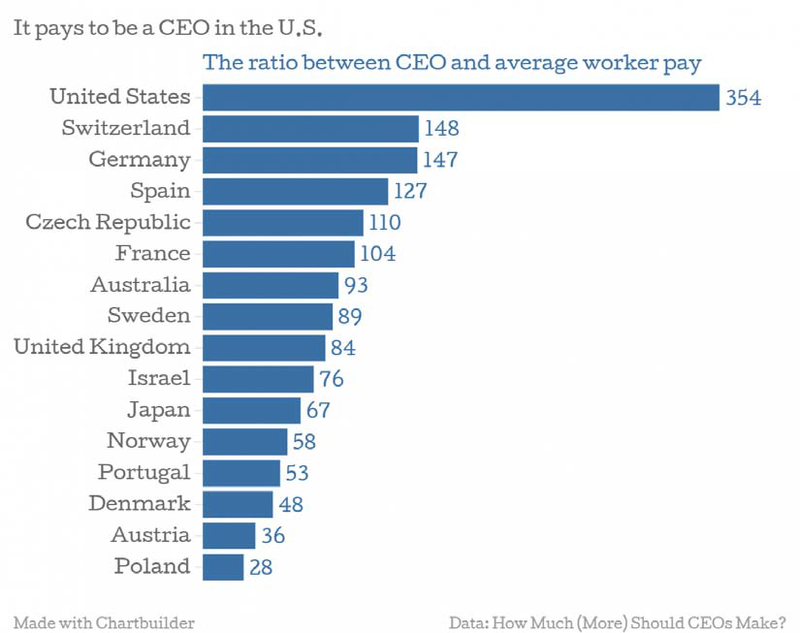 The wage gap between workers, including skilled workers, and CEO’s is soaring. It is time for real Reforms. I. American workers must come first. —with American workers completely ignored. American workers should be the first concern in when addressing the importation of labor. II. Create a cause of action for Americans against employers who abuse guest worker programs. Currently, the only recourse for Americans who are adversely affected by H-1B is to file a complaint with DoL and hope that it is acted on. Such complaints must fit the narrow bounds of DoL’s enforcement authorization. Congress should create a cause of action for Americans who have been the victims of H-IB abuse; one that should cover indirect use of H-IB workers as has taken place at Southern California Edison. III. The statutes should be clearly written and easy to understand. The Immigration Act of r952 creating the current system was about r25 pages long. S.744 from last session, “Comprehensive Immigration Reform” was 1,168 pages. The reason for the length of S.744 was to hide the endless mischief the bill contained. For example, one problem that the Department of Labor Inspector General repeatedly raises in its reports to Congress is that DoL must approve all H-1B labor condition application within seven days as long as the form is filled out correctly. S.744 devoted a page to addressing that issue by rewording the sentence so that the DoL must approve all H-1B labor condition applications within ro days as long as the form is filled out correctly. In other words, the authors of S.744 to affirmative steps to ensure H-1B abuse could go on with impunity and used length to hide their abuse. IV. Reduce the number of guestworker programs. Under the Immigration Act of 1952 there were two guest worker programs. Now there are so many that it is nearly impossible to count them all. A. End treaty guest worker programs. Currently there are dedicated visas for Mexico & Canada, Chile, Singapore, and Austral- ia. That will simply encourage other countries to demand the same. There have been re- cent proposals to add Ireland and Korea to the list. An immigration system that sets aside separate visas for individual countries is unworkable. V. Establish clear paths for entry into the U.S.
Duel intent should be abolished. Non-immigrants should come to the United States for a single purpose so the alien knows where he stands when he arrives on our shores and that the system can be enforced. Allowing non-immigrants (low standard) apply for green cards (high standard) has an entirely predictable result: backlogs. The New Jersey Turnpike Merging six lanes into three lanes. Allowing H-1B workers to apply for green cards has the same effect. VI. Make guestworkers be guestworkers. A. Limit guest workers to short terms of admission. Guest worker programs should authorize admission for no more than 2 years. B. Require guest workers to have an actual, identifiable job before they arrive. The largest use of H-1B and OPT guest workers is to farm them out to other companies. That permits the abuse we have seen at Northeast Utilities in Connecticut, Southern Cal- ifornia Edison, and Walt Disney World in Florida. Allowing guest workers to be subcon- tracted out puts the in direct competition with United States workers. C. Require guest workers to be paid at the 67% percentile. If guestworkers actually have special skills that cannot be found in the United States, they would be paid a wage that is much higher than average. Ensuring all guestworkers be paid a higher than average wage would restrict the program to truly high skilled workers. In point of fact, just limiting H-1B visas to workers who are paid the actual prevailing (i.e., the median wage for the occupation and location) would ensure the H-1B quota would not come close to be reached. VII. Eliminate green card queuing. Change the permanent residency system so that it makes decisions. Establish preference criteria for green cards and pick the most qualified applicants at regular intervals. Reject the others and let them move forward in their lives. VIII. Eliminate employment- based green cards. Immigrants should sponsor themselves and have control over their immigration process. Having a job offer could be part of the selection criteria. However, immigration should be for immigrants and should not be a corporate fringe benefit. Currently enforcement of employment-based immigration is scattered across agencies and provisions. For example, now an employer that abuses the system and gets barred from the H-1B program can still get foreign labor on student visas or other programs. Enforcement should apply across all immigration programs. The power grid is a critical part of American infrastructure. It cannot be secure when its software is created by foreign guestworkers and managed by foreign offshoring compa- nies. Foreign guest workers should be prohibited from working on critical infrastructure and projects with national security implications. XI. Require DHS to make all employment- based visa data available with only PID removed. With the low cost of disk storage and the facilities of the Internet, there is no reason why comprehensive data about all guest worker programs should not be on-line and available for the public to monitor what is going on. Personally Identifiable Data can easily be re- moved. It is now over twenty years since I first started researching guest worker programs. I am disheartened every time I examine legislation in this area. How many Southern California Edisons, Walt Disney Worlds, Cargills, Northeast Utilities, ... Sealands or AIGs is it going to take to get Congress to address H-1B abuse? Looking at the major pending H-1B bill, the I-Squared Act, my hope for the future sinks even further. I have gone through the bill and applied all of its edits to the U.S. Code. In regard to protections for U.S. workers, there are none in the I-Squared Act. In regard to enforcement, there is nothing. Or I should say it is worse than nothing be- cause the I-Squared Act makes enforcement more difficult because it restricts DHS when processing renewals of H-1B visas. If some lobbyist when through the entire immigration system, looked for every possible place to increase the amount of foreign labor, and put them in one bill without any co- herent plan, we would have the I-Squared Act. There are so many increases that enacting the I-Squared Act would mean unlimited foreign labor. (iii) if the number calculated under clause (i) is more than 195,000, 195,000.
be made available beginning on the 46th day on which petitions may be filed for such fiscal year. (ii) If the base allocation of cap-subject nonimmigrant visa petitions approved under section IOI(a)(I5)(H)(i)(b) for a fiscal year is reached during the r5-day period ending on the 6oth day on which petitions may be filed for such fiscal year, an additional r5,ooo such visas shall be made available beginning on the 6rst day on which petitions may be filed for such fiscal year. (iii) If the base allocation of cap-subject nonimmigrant visa petitions approved under section 1o1(a)(15)(H)(i)(b) for a fiscal year is reached during the 30-day period ending on the 9oth day on which petitions may be filed for such fiscal year, an additional ro,ooo such visas shall be made available beginning on the 9rst day on which petitions may be filed for such fiscal year. visas shall be made available beginning on the date on which such allocation is reached. (v) If the number of cap-subject nonimmigrant visa petitions approved under section 1o1(a)(15)(H)(i)(b) for a fiscal year is at least 5,000 fewer than the base allocation, but is not more than 9,999 fewer than the base allocation, the allocation adjustment for the following fiscal year shall be -5,ooo. least ro,ooo fewer than the base allocation, but not more than r4,999 fewer than the base allocation, the allocation adjustment for the following fiscal year shall be -10,000.
least 15,000 fewer than the base allocation, but not more than 19,999 fewer than the base allocation, the allocation adjustment for the following fiscal year shall be -15,ooo. least 20,000 fewer than the base allocation, the allocation adjustment for the following fiscal year shall be -20,000. Where is the outrage in Congress when Americans citizens legally are being displaced and bypassed for jobs in their own country?